1. 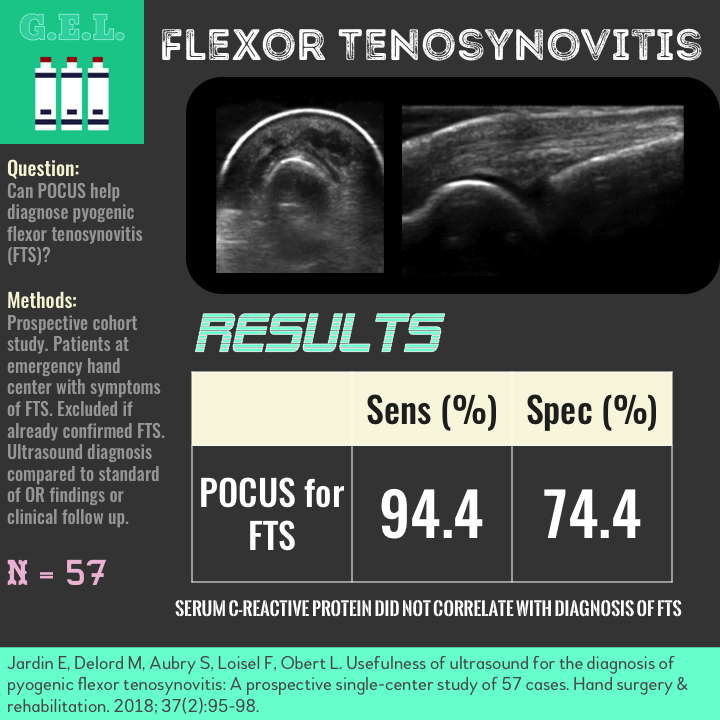 Based on this early data, ultrasound for pyogenic flexor tenosynovitis may be fairly sensitive but is not specific. 2. Sonographic signs of pyogenic flexor tenosynovitis are A) fluid around the tendon sheath and B) thickened and hyperemic synovial sheath. It’s a tale as old as time. The physical exam fails and ultrasound has the potential to save. In this case, we are talking about pyogenic flexor tenosynovitis (PFT), a serious infection in the finger that often requires operative intervention. Kanavel’s signs are commonly used, but may not be present in everybody. Ultrasound is commonly used to assist in inflammatory flexor tenosynovitis, but only more recently has the point-of care sector attempted to use this for infectious (or pyogenic) PFT. This use has not been well studied. We don’t know how good it is for the diagnosis or even, if it would help beyond the physical exam. We do know that in PFT fluid forms around the tendon, and we also know that ultrasound is good at seeing fluid. The idea is to look at some cases in which these investigators utilizes point of care ultrasound and see how this modality could potentially help with this diagnosis. How accurate is point of care ultrasound at diagnosing pyogenic flexor tenosynovitis? If ultrasound was positive → went to operative room, cultures taken. PFT considered ruled out if no findings of suspicious fluid or pus, or positive culture. If ultrasound negative → treated as cellulitis with antibiotics (amoxicillin/clavulanic acid) + immobilization. Seen every 2 days until infection improved. Up to surgeon if these went to surgery. Considered PFT ruled out if improving in < 21 days. 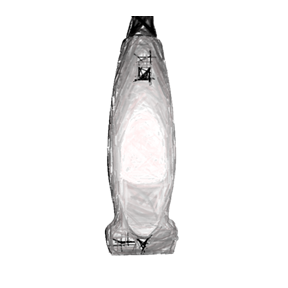 1 False negative. Eventually went to operating room due to poor clinical outcome. Remember these are the accuracies for patients with an uncertain diagnosis. If patients with more obvious PFT were included, ultrasound may have been more accurate (or worse). I would have liked to know out of the two US findings, which was more accurate. Maybe all of the false positive were from the thickened synovial fluid. They did not analyze them separately. Hard to say how much ultrasound helps beyond standard diagnostic work up. How would they have done without ultrasound? Would have been interesting to have two-armed study - one group got ultrasound other got standard diagnostic work up. There is some evidence that ultrasound may be more accurate than the physical exam, but this study was in inflammatory flexor tenosynovitis. This is obviously not definitive evidence that the CRP is not helpful. It is a small sample; there was a difference between groups that only barely missed statistical significance. Interesting that US is more sensitive than specific. This is somewhat unusual for point of care ultrasound. Generally, it is not the best at ruling out something but when you see it - you know it's there. In this case of higher specificity, the question becomes - is it good enough to rule out the diagnosis? We’re probably not there yet. This study wasn’t enough data to safely change your practice. However, if you have a really low pre-test probability, maybe this can help you determine it is unlikely. It is kind of a bummer that it is not as specific as previously thought (especially as this is implied in many case reports), but it is good to have this information. 1. Based on this early data, ultrasound for flexor tenosynovitis may be fairly sensitive but is not specific. 2. Sonographic signs of flexor tenosynovitis are A) fluid around the tendon sheath and B) thickened and hyperemic synovial sheath.